These behaviors may also be the symptoms of other problems. That is why you have to make sure that your dog actually suffers from separation anxiety. A visit to the vet will ensure that there are no underlying medical problems. These are signs of a dog that has become overly dependent on her owner. Sometimes you unintentionally invite this kind of behavior when, for example, you pay too much attention to your dog’s reactions every time you leave the house to go to work. Spending time trying to reassure your dog that you will be back does not make it easier on her as you would think, but actually makes your departure an even bigger event. It also teaches your dog that this kind of behavior always gets your attention so now she has a way to emotionally control you. You could schedule some time every day in order to exercise and play with your dog and give her your undivided attention. A happy dog is less likely to cause trouble. If your dog likes digging you can designate an area in the yard where it’s ok for her to dig during your absence. We have written an extensive blog post on how to build a dog-friendly garden in which we look at ways to help pet parents deal with this specific challenge. Keep your arrivals and departures low-key. For example, when you arrive home, ignore your dog for the first few minutes, then calmly pet her. This may be hard for you to do, but it’s important. Leave your dog with a piece of clothing that has your scent on it -such as an old t-shirt that you’ve slept in recently. Get GPS tracker and monitor your dog's activity, see where he or she likes to out most, sleeping patterns and locate them if they tend to run away. Read our GPS Dog Collar Reviews post to help you learn more. For more severe cases, these techniques should be used along with desensitization techniques which currently are the most accepted method for treating dog separation anxiety. This kind of treatment involves planned departures and it is a systematic process of getting your dog used to being alone by exposing her to many short departures. At the beginning you should leave your dog alone only for very short intervals (seconds to minutes) so that you have plenty of time to get back before the stress symptoms occur. You must carefully observe the dog for any signs of anxiety or extended greeting behavior upon return. If none of these occur you can gradually increase the time your dog is left alone until you reach the 1.5 hours mark at which point your dog can usually be left alone all day. To visually see this technique in action, Julie Weber, dog trainer, uses a dog training clicker and positive reinforcement training to help a dog with separation anxiety through a behavior modification process. Keep in mind that your departure and return should be made as quiet and uneventful as possible to avoid over-stimulating your dog. The dog should not be given any special attention before your departure or any praise upon return. There are some cases where even more drastic measures should be taken in order to reduce the dog’s dependency on her owner. If this is the case for you then you are required to ignore your dog for a period of time -sometimes as long as three weeks. Ignoring your precious pet may prove very hard for you but it will decrease your dog’s extreme dependency on you and allow her to endure your absence without anxiety. Punishment is not an effective way to treat separation anxiety and may actually increase the symptoms. Crating your dog during your absence. By crating your dog when you are away you’re just avoiding any damage to your belongings but you’re not helping the dog overcome her anxiety. She can still engage in a number of anxiety responses in the crate (howl, bark, urinate) and even runs the risk of injuring herself in an attempt to escape. Also your dog learns to associate the crate with your departure and sees it as a means of punishment so you lose the advantage of using it to confine your dog at other times when it’s necessary. Dog separation anxiety is a disorder and it should be treated as one. It is not something that will simply disappear with time. Your vet may be able to help get a treatment program started or could refer you to a certified animal behavior consultant or a certified applied animal behaviorist who may be more familiar with treatment alternatives. 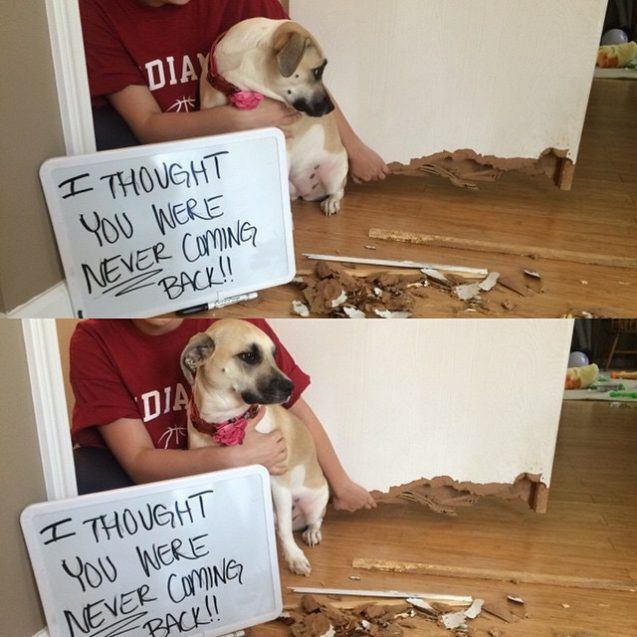 It is important to understand that your dog is not bad or spiteful and is not destroying your house just to get revenge on you for leaving her, though it may seem that way. If you are willing to spend time working with your pet you have a very good chance of eliminating the problem for good. 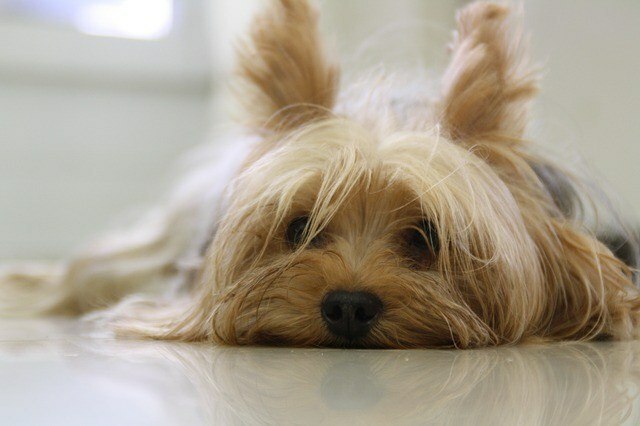 Do you have a success story about getting your pup through separation anxiety? Share your tips and tell us how you did it in the comments below.